HomeCommunity NewsTis the Season in Historic Ybor City! Historic Ybor City is planning to celebrate the holidays all season long with a variety of family-friendly offerings, proudly brought to you by the Ybor Collaborative; Ybor Chamber of Commerce; Ybor Merchants Association and GaYBOR. On Wednesday, November 15, join Mayor Buckhorn as Ashley Global Retail presents the annual Holiday Tree Lighting at Centro Ybor. This free event will feature holiday music, entertainment, delectable delights, and an opportunity for a holiday photo with Santa himself! The magic of the season continues with the Winter Village every Sunday from November 19 through December 17 as we join with our neighbors in downtown Tampa to bring the Winter Village Express experience to Ybor. This dedicated transformed TECO Streetcar will make the trip from downtown to Ybor with some special holiday surprises every half hour. At either destination you will be transported to a winter village. In Ybor you will find free kids arts and craft activities, some holiday shopping opportunities and a lot of holiday cheer from our local Ybor businesses who have decked the halls for the occasion. 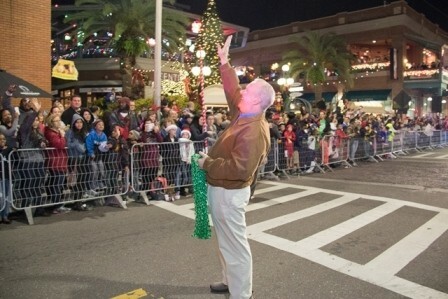 The Florida winter miracle becomes reality on December 9th with the 7th Annual ‘Snow on 7th’ Parade. This free event will feature the largest assembly of High School Bands (18) hosted by the Tampa Bay Pride Band and will give back to those local schools to promote and continue the education of the arts. The Pre-Show brought to you by Bella Danza is sure to delight in front of Centro Ybor. Kids of all ages will entertain you while we usher in Mayor Buckhorn and his bands of merry elves culminating with a visit from the Chief Elf – Santa Claus. All this happens under the cover of ‘snow’ along 7th Avenue with 30,000 plus revelers. In keeping with the spirit of giving, we are pleased to be partnering with Balance Tampa Bay’s 7th Annual Toy Drive, PARTY for PRESENTS. The public is encouraged to bring an unwrapped toy which will be distributed to three local charities. Toy donations will be accepted at all the scheduled events through Snow on 7th on December 9th.